In using strong-armed tactics against his critics in Istanbul, Turkish Prime Minister Recep Tayyip Erdoğan has counted on the support of his political base, which is centered in Turkey’s Anatolia region. A visit to two strongholds of Erdoğan’s Justice and Development Party (AKP) suggest that while his backing in the conservative Turkish heartland is still strong, it’s potentially brittle. Expressions of discontent over the past 12 days have extended beyond Turkey’s major cities – Istanbul, Ankara and Izmir – into Anatolia. Although generally overlooked by outside media, smaller demonstrations have taken place in Konya and Kayseri -- two of the Anatolian cities where a large majority of voters supported the AKP in Turkey’s 2011 parliamentary elections. The two cities, which are included among Turkey’s so-called “Anatolian Tigers,” have experienced surging economic growth over the past decade as the AKP focused on developing the interior of the country. But that boom apparently isn’t enough to keep the lid on criticism of the prime minister and his policies. In Konya, a lecturer at Selçuk University who asked not to be named confirmed that at least three anti-government sympathy protests of about 200 people each have taken place in this city of about 1.1 million since May 31, when police first clashed with protesters in Istanbul over development plans for Gezi Park. The lecturer, however, believed that many of the students attending the short, peaceful protests were not from Konya, but had moved to the city from more liberal locations, such as Istanbul, to study. In Kayseri, a city of just under a million people, located about 305 kilometers to the east, protesters have been more vocal. Multiple residents claim that small protests have occurred daily since May 31, with attendance running into the thousands. On June 11, a EurasiaNet.org reporter witnessed in the city center a peaceful protest of roughly 200 people, organized by the leftist Labor Party and Socialist Democracy Party, to show solidarity with demonstrators who were violently evicted by police from Istanbul's Taksim Square earlier in the day. "Everywhere is Taksim. Everywhere is resistance," chanted the Kayseri protesters. 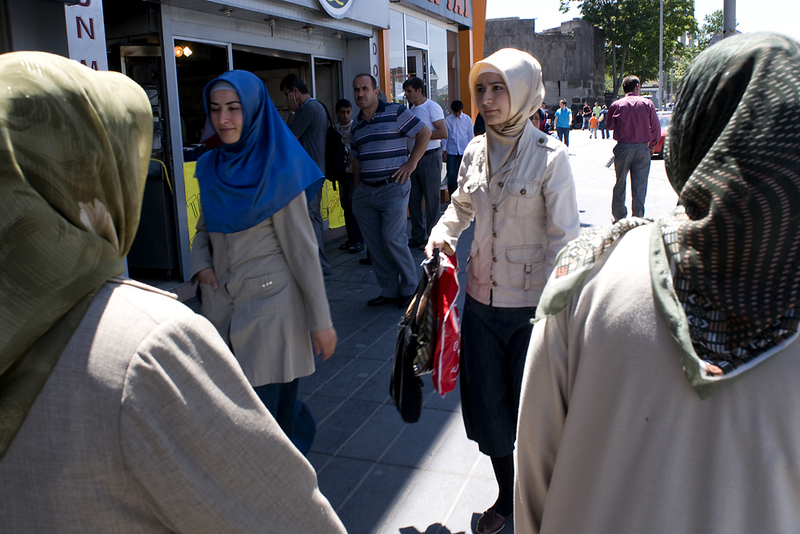 In both Kayseri and Konya, pragmatic support for the AKP appears to outweigh misgivings about Erdoğan’s hard line. But that stance conceivably could change if, as one economic consultant predicts, Anatolian companies start to feel the economic effect of the protest turbulence. Konya is known as agricultural processing center and as a car-parts producer; Kayseri for its furniture production. "These companies in Anatolia are not shielded from an economic mess," commented Emre Deliveli, who also works as a columnist for The Hürriyet Daily News. That analysis does not always hold weight with residents of business-minded Kayseri. One religiously devout, 25-year-old protester, who voted for the AKP in the 2007 parliamentary elections, scoffed at Erdoğan’s accusation that such a “lobby” is working to undermine the Turkish economy. "He appears to criticize interest, but it was during his period that banks made the most from interest,” said the protester, who gave his name as Usuf. “The AKP has become a party of capital and capitalists." Since 2007, Usuf has sided with the right-wing Nationalist Movement Party (MHP), instead of the AKP. Interviewed residents tended to frown on police brutality against Taksim demonstrators, but many also did not sympathize with the protesters. One 29-year-old Kayseri resident, who gave his name as Suleiman, said that he had never voted for the AKP before, but that the prime minister has his vote in the 2014 presidential and 2015 local and parliamentary elections "because he stood upright" against demonstrators. "I have realized this is how Erdoğan needs to speak because the other side deserves it,” said Suleiman. Even though support for the AKP and Erdoğan may have slipped somewhat in Konya and Kayseri in recent days, a significant majority remain loyal to incumbent authority. “He [Erdoğan] gets things done," specified 57-year-old retiree Mahir Süslü. "Nothing has changed completely, but there have been improvements in the last 10 years,” said Ali Kırbaç, a 58-year-old pensioner who credits the AKP for his monthly pension having more than doubled since 2006 to 1,250 lira ($661). Both Kırbaç and Süslü have voted for the AKP and repeated the party line that the demonstrations were "provoked by marginal groups" conspiring against Turkey. Süslü listed Erdoğan's top achievements as containing the extrajudicial forces within the military, paying off Turkey's multi-billion-dollar debt to the International Monetary Fund, and providing affordable housing to the poor. His only complaint was the low minimum wage of 773 liras ($411.63) per month. But that was the fault of the private sector, he added. "If a young and better leader comes, of course, Tayyip should go, but there is no one on the political scene that surpasses Tayyip Erdoğan," he said.